A need to address a lack of housing for the globe’s growing population has turned up some eye-catching efforts, blending creative architecture with new, sustainable technologies. And it is increasingly looking like 3D printing could have a role to play. 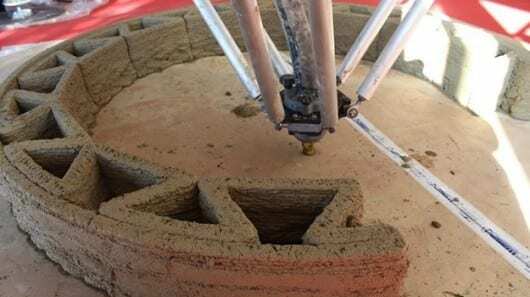 Italian firm Wasp is the latest to explore the potential of additive manufacturing in this area, developing a super-sized 3D printer capable of producing low-cost housing made from mud. Mud brick homes aren’t new, and have a certain appeal for the environmentally conscious due to their low carbon footprint and sustainable nature. Wasp is looking to bring these benefits to a bigger stage by providing a means to quickly create shelter in developing regions where traditional forms of construction might not be possible. The company’s mud-extruding dream builder stands around 20 ft tall (6 m) and is capable of printing structures 10 ft (3 m) in height. This puts it at around the same size as the printer used by a Chinese company earlier this year to construct 10 houses in less than 24 hours. The idea behind Wasp’s approach is the housing can be built on location, using materials found on site at zero cost. The printer can reportedly be built by two people in as little as two hours and can extrude materials ranging from mud to clay and other natural fibers. The company demonstrated the printer earlier this month at Rome’s Maker Faire. While not a full scale model, at 4 m (13 ft) it was able to produce smaller versions of its mud brick dwellings and serve as a proof-of-concept. April 1, 2019 - 'lesser houses' are 3D printed habitats for the insects in your home Designboomlesser house highlights the remarkable diversity of life around us through a series of 3D printed houses for bugs and insects in search of a place to stay. April 3, 2019 - 3D Printing in Construction – How Long Does it Take to Print a House? All 3DPMany companies have turned their attention to 3D printing construction. But the question remains, how long does it take to print a house? Find out! January 21, 2019 - 3D-Printed Houses Are Now Easier To Build In Austin, But Don't Expect A Whole Neighborhood Of Them KUTAn Austin-based company is ushering in 3D technology that makes it easier for builders to print homes. Residential building company Sunconomy LLC and. February 28, 2019 - TU Graz building the foundation for 3D printed houses 3D Printing IndustryGraz University of Technology (TU Graz) in Austria is working on a project investigating the development of 3D printed concrete parts for construction. February 27, 2019 - 3D-printed house is made from biodegradable materials DezeenThe latest instalment of our Dezeen x MINI Living series features a sustainable 3D-printed house called Gaia made with soil and agricultural waste. March 7, 2019 - Carson: 3D printed houses cheaper, faster, more resilient than average buildings Fox BusinessManufacturing homes with 3D printers can make a "real dent" in the affordable housing crisis, Carson said.